WP Robot was already considered the best WordPress autoblogging plugin by many when we decided to make it even better. The new version 5 is our largest update since the first version of WP Robot was revealed back in 2009. Through constant support we always make sure that WP Robot keeps working with the latest version of WordPress. Large parts of the plugin were rewritten from scratch and so WP Robot 5 is essentially an entirely new plugin. It has received a new modern interface and many other new features to make sure it can deliver you top autoblogging results as well as to make it ready for the latest SEO trends. Version 5 has been rebuilt from scratch and received a brand new UI. MORE SPEED: An entirely new interface makes WP Robot 5 easier to use for beginners and faster for everyone. MORE POWER: With many new content sources and module settings WP Robot 5 offers more autoblogging possibilities than ever. MORE FLEXIBILITY: Thanks to the new campaign specific settings there are no site-wide options holding you back anymore. MORE MODERN: With new curation and rewriting features WP Robot 5 is ready for SEO autoblogging after the latest Google updates. To make WP Robot easier to understand for beginners we have redesigned the entire user experience. The new interface is not only easier to use but more modern and faster as well. 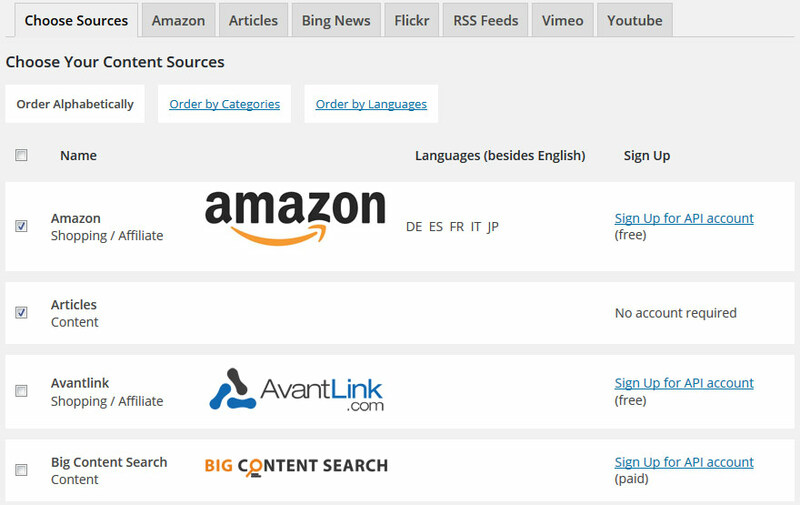 With content curation becoming more important due to recent Google updates our version 5 lies a big focus on it: The new Curation page allows you to create articles by combining multiple content sources in a flexible building-blocks system, enrich them with your own content, preview them and then schedule them on your site. 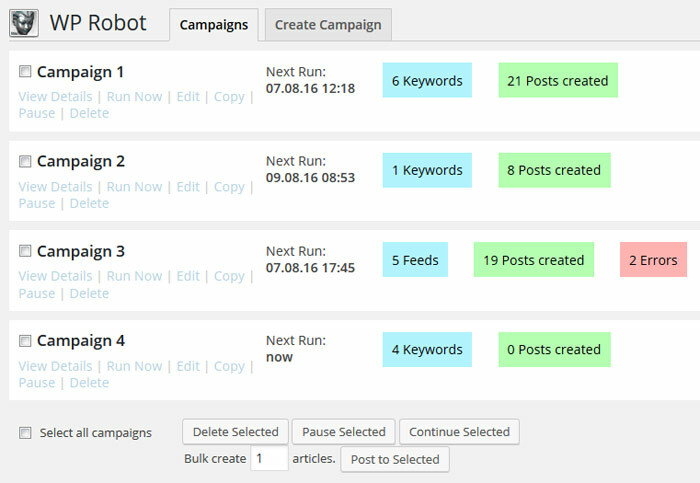 You can now see exactly which articles WP Robot 5 has created on your site and even edit or delete them directly from within your WP Robot plugin dashboard. In WP Robot 4 many people were held back by the fact that many settings had to be set site-wide. With version 5 that limitation is gone and you can now override any setting of your choice on the campaign level. This allows for much more flexibility and makes it possible to build more advanced autoblogs. Vimeo for posting high quality videos. PhotoBucket for photos and images. Bing News for posting current news. Etsy for posting handmade products. Zanox, another popular affiliate network. Expedia for posting hotel listings. Prosperent for affiliate marketing deals. 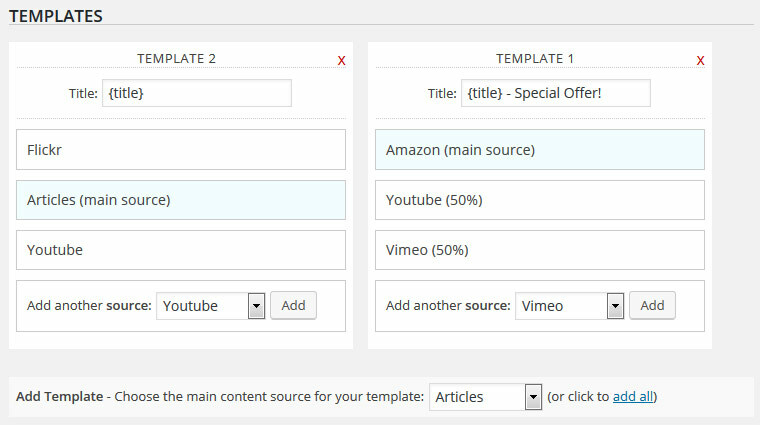 Thanks to new SaaS elements in WP Robot 5 you can now easily import and export your options between all the sites you are using the plugin on. WP Robot 5 can now automatically be updated on the WordPress plugins page, just like any of the free plugins hosted in the wordpress.org plugin directory. For RSS feeds that only contain an excerpt of the content WP Robot 5 now offers a 1-click full text conversion, to still enable you to post the full article even if it is not found inside the feed. We have simplified the template system during the campaign creation process to make it both faster and easier to understand for new users. You can now select any of your modules and combine them in any way with a new drag and drop interface. Many of our old modules have also received updates and improvements in WP Robot 5. The Amazon module does now allow you to search for discounted products, making it possible to build deal and special offer autoblogs. The Youtube module has a new video channel filter and much more.